The Fokker 60 is a short to medium range tactical transport airplane developed by the former Dutch company Fokker. The 4 only Fokker 60's were produced for the Royal Netherlands Air Force. They were build from the Fokker 50 with the addition of an enlarged fuselage en strengthened cargo floor. The Fokker 60 Utility airplanes from the RNLAF are capable for various missions: transport of people, cargo and medical evacuation. The Fokker 60 equipped with electronic countermeasures can operate in a war environment: example to drop paratroops. They will also be used for the Dutch Amy para troops and the Dutch green berets for para dropping. The strengthened cargo floor was used for quickly transport of a F-16 engine. The RNLAF has a fleet of 4 Fokker 60 Utility airplanes which are/were stationed on Eindhoven Air Force base with the 334 squadron. 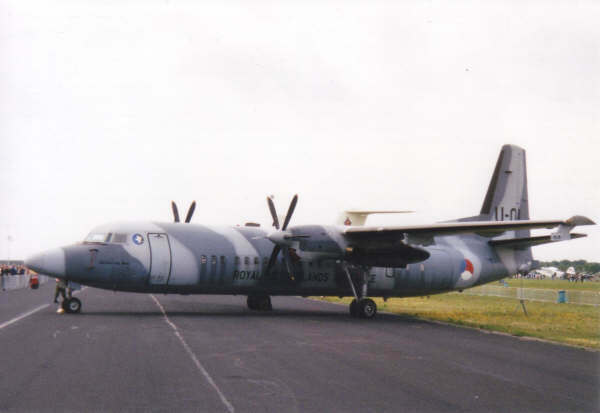 - 2 Fokker 60 airplanes (of the 4) have been sold to can buy a 3rd C-130 Hercules. - 2 Fokker 60 were converted and were used for air reconnaissance for the Coast Guard of the Netherlands Antilles and Aruba for 1.5 till 2 years. The 2 other Fokker 60 airplanes will be sold in a few years to buy a 2 C-130H Hercules for the Royal Netherlands Air Force.